Sometimes it's interesting to randomly generate a large amount of valid sentences from a context free grammar. The best use for this is automated stress-testing of parsers for those grammars . So how would you generate sentences? be several productions separated by '|'. CFG represents a context free grammar. It holds productions in the prod attribute, which is a dictionary mapping a symbol to a list of its possible productions. Each production is a tuple of symbols. A symbol can either be a terminal or a nonterminal. Those are distinguished as follows: nonterminals have entries in prod, terminals do not. gen_random is a simple recursive algorithm for generating a sentence starting with the given grammar symbol. It selects one of the productions of symbols randomly and iterates through it, recursing into nonterminals and emitting terminals directly. It has a single nonterminal, S and a single terminal a. Trying to generate a random sentence from it sometimes results in a RuntimeError exception being thrown: maximum recursion depth exceeded while calling a Python object. Why is that? Consider what happens when gen_random runs on this grammar. In the first call, it has a 50% chance of selecting the S S S S production and a 50% chance of selecting a. If S S S S is selected, the algorithm will now recurse 4 times into each S. The chance of all those calls resulting in a is just 0.0625, and there's a 0.9375 chance that at least one will result in S and generate S S S S again. As this process continues, chances get slimmer and slimmer that the algorithm will ever terminate. This isn't good. When I try to generate random sentences from it, less than 30% percent of the runs terminate . 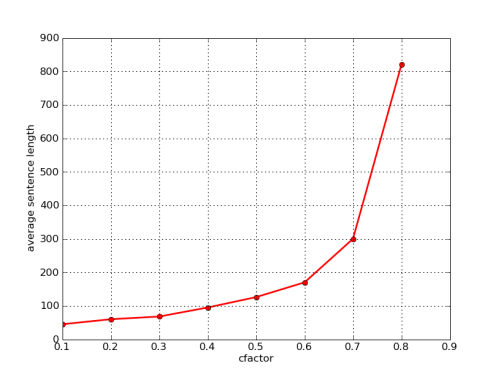 The culprit here is the ( EXPR ) production of FACTOR. An expression can get expanded into several factors, each of which can once again result in a whole new expression. Just a couple of such derivations can be enough for the whole generation process to diverge. And there's no real way to get rid of this, because ( EXPR ) is an essential derivation of FACTOR, allowing us to parse expressions like 5 * (1 + x). The bluish nodes represent nonterminals, and the greenish nodes represent possible productions. If we think of the grammar this way, it is obvious that the gen_random method presented earlier is a simple n-nary tree walk. Note that initially all the productions of expr have the same weight, and will be selected with equal probability. Once term - expr is selected, the algorithm takes note of this. 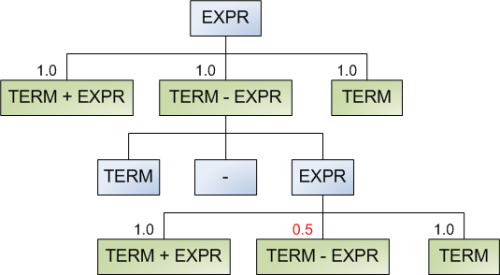 When the same choice is presented again, the weight of term - expr is decreased by some factor (in this case by a factor of 2). Note that it can be selected once again, but then for the next round its weight will be 0.25. This of course only applies to the same tree branch. If term - expr is selected in some other, unrelated branch, its weight is unaffected by this selection. grammar, starting with the given symbol. # to avoid modifying the parent's pcount. As expected, the average length grows with cfactor. If we set cfactor to 1.0, this becomes the naive algorithm where all the productions are always of equal weight. While the naive algorithm is suitable for some simplistic cases, for real-world grammars it's inadequate. A generalization that employs weighted selection using a convergence factor provides a much better solution that generates sentences from grammars with guaranteed termination. This is a sound and relatively efficient method that can be used in real-world applications to generate complex random test cases for parsers. Another could be some rudimentary form of random text generation, although the resulting text isn't very comprehensible. Markov chains are much better for this. A larger percentage can be achieved by increasing Python's recursion depth limit, but this is not the point. Some algorithms, like this one by Randal Schwartz, assign fixed weights to each production. While it could be used to decrease the chances of divergence, it's not a really good general solution for our problem. However, it works great for simple, non-recursive grammars like the one presented in his article.